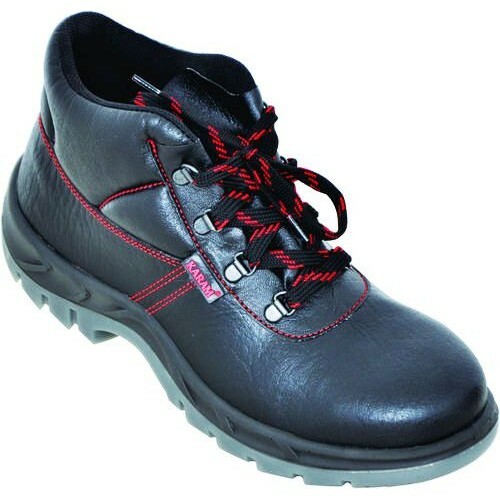 Karam GRIPP FS 21 Safety Shoe This model is a smart lace up shoe providing a complete protection to the ankle. Distinguished Features: Ankle protection Shoe. Has bellow tongue which prevents spillage of water and liquids inside the shoe. Metallic D-Ring eyelets and flat laces for better knotting grip. Has attractive red stitching with bonded thread. Sole Features: Double density PU/PU sole for high durability and flexibility. Cleated Outsole with wider cleats for higher grip and self cleaning effect. Antistatic, Oil/Acid Resistant, Anti Slip and Heat Resistant with shock absorbing property, Anti Fatigue.